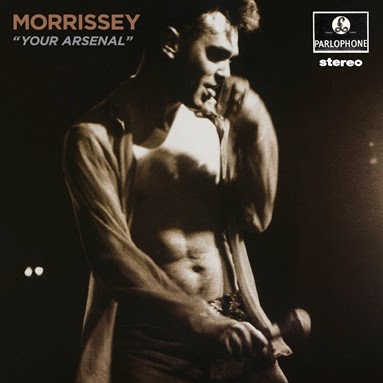 The newly remastered version of Morrissey's 1992 album Your Arsenal is out today in North America on cd, vinyl, and as a digital music download. The cd version of comes with a bonus DVD filmed at Morrissey's October 31st, 1991 show at the Shoreline Ampitheater in Mountain View, California. NME posted exclusive video of "We Hate It When Our Friends Become Successful" taken from the DVD which you can watch here. Meanwhile, two screenings of Morrissey: 25 Live will take place in the Detroit area on February 26th at the Berman Center for the Performing Arts in West Bloomfield. Purchase tickets for the 2pm screening and the 7:30 screening. Morrissey launches his North American tour in May. Several shows on the tour -- Los Angeles, Chicago, Boston, San Jose, Wilmington, Austin, Dallas, St. Petersburg, Baltimore, and Hershey -- have already sold out.